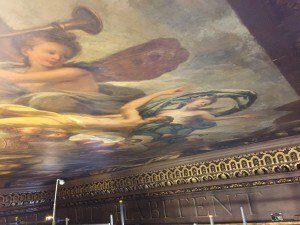 The Painted Hall in Greenwich is the most spectacular Baroque mural in Britain. 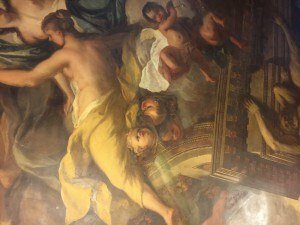 Located in the Old Royal Naval College it is a must see for any visitor to Greenwich in south east London. 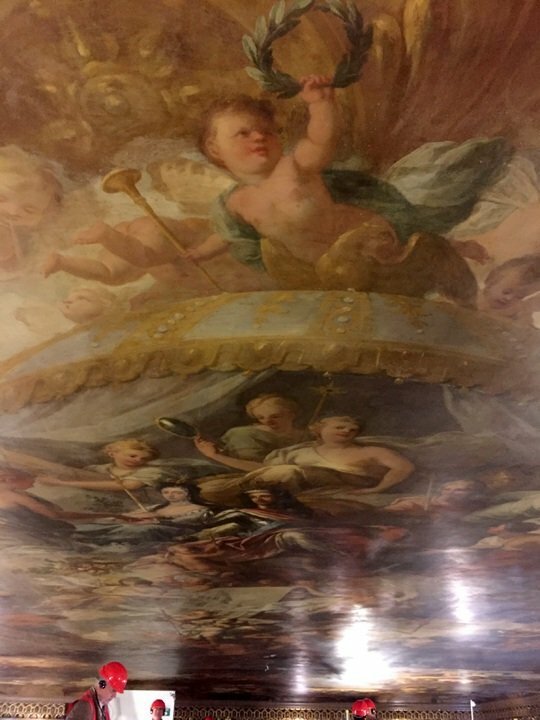 The vast ceiling was painted between 1707 and 1726 by British artist James Thornhill. 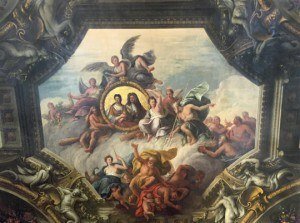 This masterpiece of baroque art is both a trompe l’oeil mural painting and a giant piece of Royal propaganda. 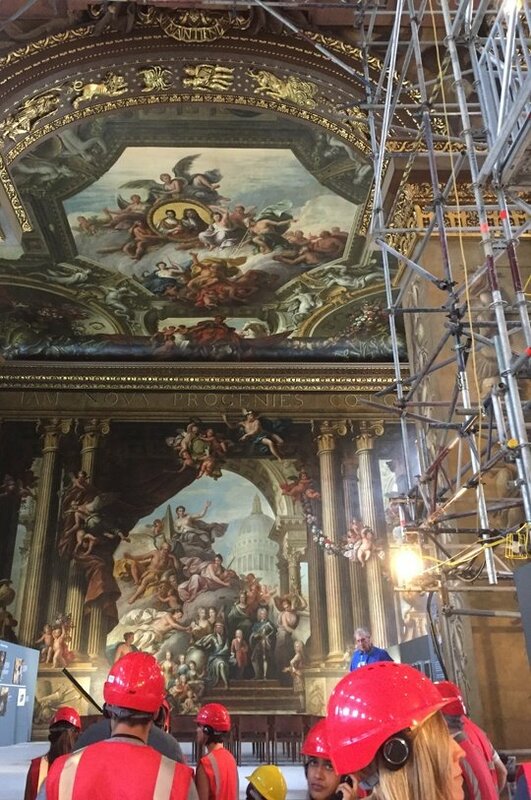 A major conservation of the mural at Painted Hall in Greenwich is currently underway. The West Wall was successfully cleaned in 2012 revealing the original vibrancy of Thornhill’s mural. Now it’s the turn of the huge 40,000 square foot ceiling. 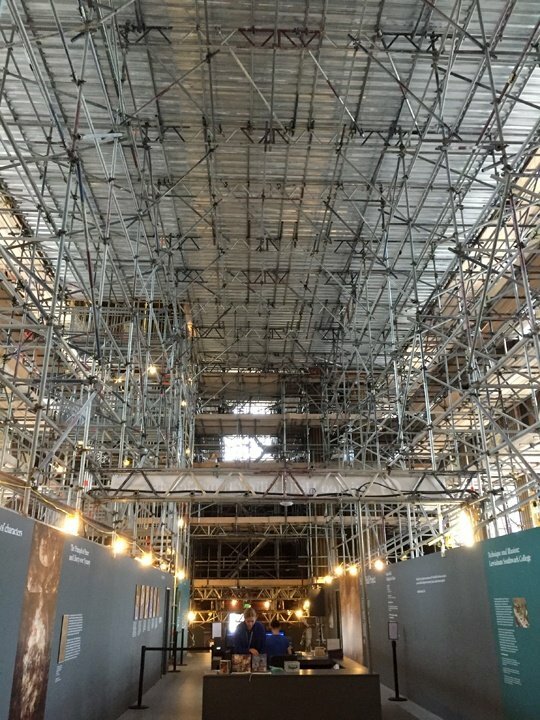 The interior of the hall has been scaffolded out to allow conservators to ascend the sixty feet up to the ceiling to work. 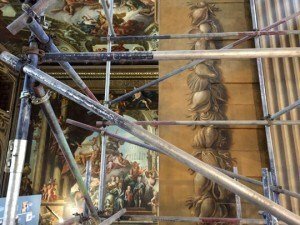 For a limited time visitors to Greenwich can climb the scaffolding to take a close look at the painting and the conservation work in action. 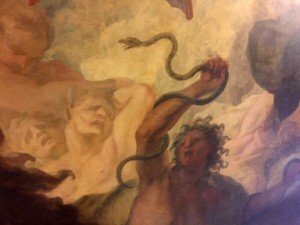 Not to be missed, I took this once in a lifetime opportunity to take a closer look at the masterpiece. 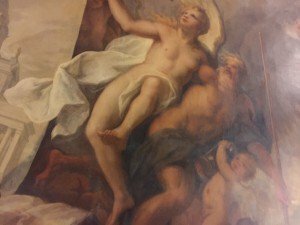 The mural was painted in oil paints and over the years has been repeatedly varnished. 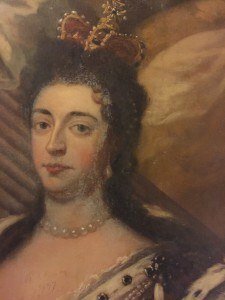 The conservation process will consist of careful cleaning together with some varnish removal or consolidation and some repair with conservation paints. Thornhill painted this huge work at the Painted Hall in Greenwich, both as a celebration of British Sea Power and as a giant piece of propaganda. This was propaganda to establish the Dutch Protestant claim to the English throne over the Catholic House of Stuart. 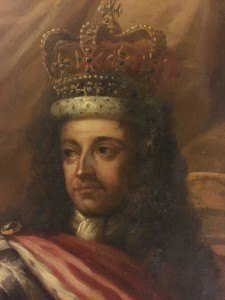 This followed the so called ‘Glorious Revolution’, which saw the Dutch army of William of Orange and Mary force out the Catholic King James II and establish a Protestant only royal house under Parliament. 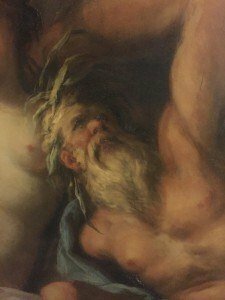 After climbing the scaffolding stair up to the ceiling you are immediately struck by the scale of the painting and the sheer difficulty of seeing the work. 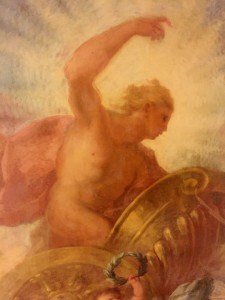 The skill demonstrated to achieve this feat of trompe l’ceil is amazing. From the painters view up at the ceiling it is impossible to judge scale or perspective. 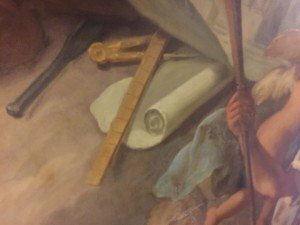 Indeed Thornhill undertook many scale drawings before starting the painting and it is obvious that such careful planning was essential. 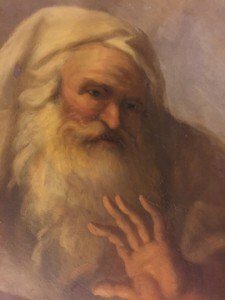 John Worley was his name, after seventy years at sea, he had retired to the Seamen’s hospital in Greenwich. Worley was one of their first pensioners after the hospital was opened by King Charles in 1705. Obviously he had started his life at sea as just a very young boy on a coal trader, later moving on to the Navy. John Worley must have been quite a character. Despite being in his eighties when he retired to the Greenwich Hospital he still managed to be reprimanded more than once for drunken and disruptive behaviour according to the early hospital records. Worley obviously caught the attention of the artist James Thornhill and was certainly a well know character locally. 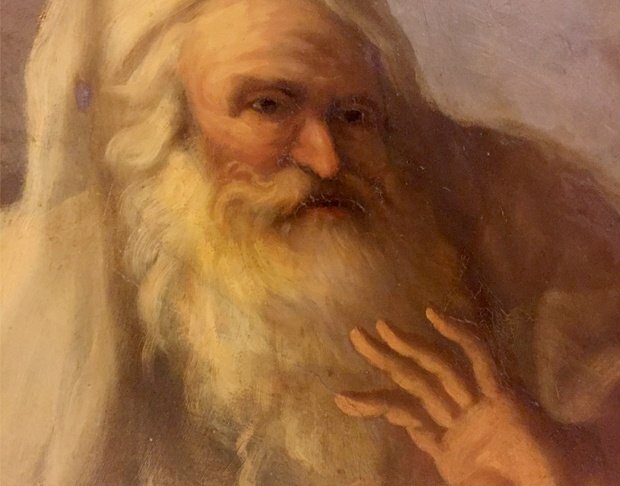 Thornhill decided to use Worley as his representation of Winter in the ceiling mural and carried out at least one portrait study before the mural painting.